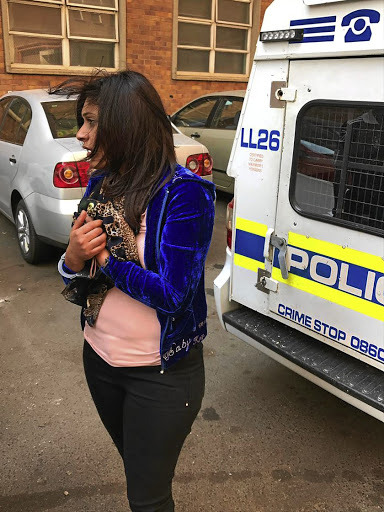 A crime spree by a beautiful young thief who pretended to be a Yemeni princess appears to have come to an end with the arrest this week of a 28-year-old woman at a guesthouse in Gauteng. After almost two months of evading police, Warda Ibrahim, who was wanted in Durban and Johannesburg for the theft of cash and jewellery, was nabbed by police in Crosby on Thursday. The Sunday Times reported two weeks ago that Ibrahim, along with the suspected mastermind behind the thefts – the elderly “Uncle Haji” – duped an upmarket Umhlanga jewellery store into believing she was Yemeni royalty who had cash to splash. They allegedly made off with a 5ct diamond and a Rolex watch, worth almost R1-million. Private detective Brad Nathanson, who was hired to track down the diamond, said: “She was introduced as a princess from Yemen, who could not speak English. Uncle Haji acted as the interpreter. “From the CCTV footage we could see how one attendant was distracted by another woman and a six-year-old boy in the party while Uncle Haji and Warda worked on the owner’s son, who had displayed the jewellery on the counter. Ibrahim appeared in the Johannesburg Central Magistrate’s Court on Friday, according to Gauteng police spokesman Lieutenant-Colonel Kay Makhubela. He said she was remanded in custody and would be taken to Durban to appear on a theft charge. Ibrahim has been on the run since August after skipping bail for the alleged theft of R1,795 from a cashier’s till in a Brakpan shop. She is believed to be of Yemeni descent but has a South African passport. Nathanson said the diamond had been traced to Dubai, where Ibrahim was allegedly trying to sell it. Now Uncle Haji – who is believed to be Ibrahim’s stepfather and to have a penchant for Armani and Hugo Boss suits, leather belts and designer shoes – has been flagged as wanted by the police. Haji, whose real name is Marghani Abdalla Ibrahim, is believed to have concocted the “princess” persona for his stepdaughter. Nathanson, again accompanied by police, this week went to his house in Turffontein, where they found more than 60 Hugo Boss and Armani suits, boxes of men’s shoes and over 40 leather belts.